Simon Wren-Lewis has an interesting post, Brexit harm denial and the exchange rate, where he discusses some popular notions about the great British devaluation after the Brexit vote. I have already discussed it here and explained that part is a pessimistic reading of the future trade deals that the UK might strike. If you are pessimistic then fair enough. But this is not really about economics but futurology. For a more optimistic, but very realistic understanding of the issues involved in trade deals Dr Richard North and his colleagues at EUReferendum have an excellent blog and series of monographs on Brexit, or Flexcit as they call it. Wren-Lewis who, as far as I can tell, has never written a blog post on the economics of wealth creation out of the hundreds that he has posted, is not a great guide to the workings of the market – even if, to his credit, he is occasionally sympathetic to NGDP Targeting. Wealth creation is mysterious to him, a grubby business at best, full of overpaid CEOs, neoliberalism at worst. Perhaps it just happens by chance? According to him “99% of economics is about market failure” [in a reply on his blog to a comment of mine]: the modern dismal science epitomised, and his flirtations with Corbyn explained. What caused the price change? While it is utterly wrong to argue from a price change, it is very right to try and understand what caused the price change. Why did holders of Sterling sell? Political uncertainty was a factor, but that was relatively quickly sorted out and Sterling remains at the lows. Have other factors like US Dollar strength taken over, preventing a Sterling rally. Maybe. Perhaps it was expectations that Mark Carney would dramatically ease monetary policy? In which case, the devaluation was not caused by Brexit but by the BoE’s expected stance. Although Carney had campaigned for Remain he made it clear he was ready to act if Remain lost. And he did act decisively, both on the day with interviews and somewhat grudgingly followed up with actions. A relaxed monetary policy is quite a big step for a BoE that had been tightening all through 2015, if not quite a much as the US. In that sense, Brexit got Carney off the hook of having to make a more obvious u-turn. Carney had heavily overestimated UK economic strength during 2015 and early 2016 and was going to have ease in 2016 anyway. Perhaps Sterling fell because market participants expected the UK economy to be smaller years ahead. Maybe, but it’s hard to see, practically speaking why they sold Sterling now on such an uncertain outcome, years ahead. Safe-haven buying of UK government bonds pushed down yields, which rather goes against this argument. At the end of the day, the depreciation was only 10%, not that big in longer run historical contexts. Sterling fell 25% vs the US Dollar during both the 2008 financial crisis and after the ERM exit. It often moves on unexpected political news. The mild shock of a Tory victory in May 2015 drove it up 4%. Well, he admits this is true. There will be a short term boost to exports thanks to the depreciation. And this will be good for the economy as the costs of Brexit, when it happens, will only come later. He says that “we are poorer because of Brexit”, but only because the markets expect us to be poorer and hence drove down the currency. He may be right in his interpretation, but those markets could turn out to be wrong about that piece of futurology. It is still very encouraging that Wren-Lewis recognises that market expectations can have real effects, just like market expectations about nominal growth. He also claims that “markets believe Brexit will cause an economic downturn in the UK, implying lower levels of UK interest rates. (In this they have been proved correct).” One hates to disagree with such an eminent economist in his interpretations of market moves, but the Bank of England was very confident that Brexit would cause a rise in gilt yields due to fear about the UK economy and its credit rating. Remainers like Wren-Lewis and the BoE seem like they want to be right about the negative consequences of Brexit whatever gilt yields did. What Wren-Lewis specifically fails to mention is the benefit to domestic demand of a depreciation, nicely expressed by Britmouse at Uneconomical back in January this year. Currency devaluation is a way of boosting AD, by forcing consumers to switch from overseas goods and services to domestic goods and services. This is the classic benefit of devaluation, not that it is good for exporters. The overall impact on the balance of trade is hard to tell given the inelasticity of much import demand. What tends to happen on a devaluation is that the value (in the devaluing currency) of both exports and imports rises, thus raising AD. If the devaluation was due to Carney’s expected reaction, then good. While it is “ludicrous” to suggest that the problem of overvaluation, if it existed, was overcome by the Brexit devaluation, it isn’t ludicrous to suggest that devaluation will offset some of the pain. See 1. Wren-Lewis makes an obscure argument by analogy, something about having your basic pay cut but the boss promises it won’t be that bad as bonuses will be higher. The UK may be 10% poorer in $ terms but is it really relevant when Britons are paid in Sterling and wages in Sterling didn’t move at all. The UK is a massive holder of overseas investments, was the UK richer after the devaluation also? 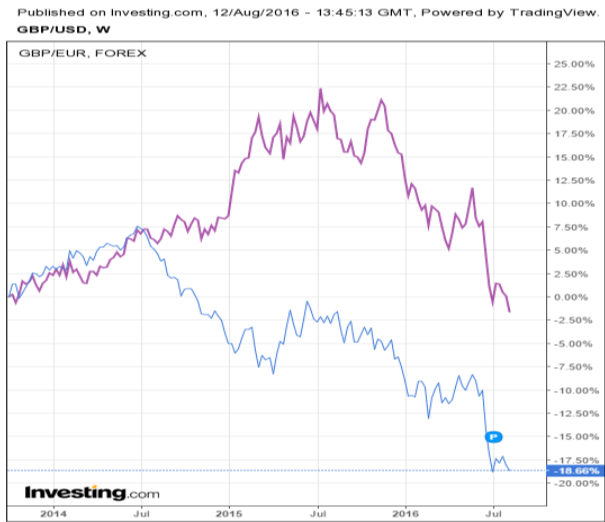 And, yes, Sterling in Euro terms (the purple line) really only was “back to where it was”. In US Dollar terms (the blue line) it has been falling for a long while, mostly due to much more US monetary tightening versus the UK. To be fair, it does depend where one starts to draw the line, but then an argument about that issue doesn’t really lead very far as more and more “noise” enters the discussion. Wren-Lewis now lays his cards on the table (I think) and assumes there will be a short term economic downturn until the UK accepts the single market and free movement, at which point “the economy then recovers, interest rates rise, and sterling appreciates”. Brexiteers can then be blamed “for all this uncertainty and the temporary damage”. Again, Wren-Lewis engages in a lot of futurology. Who knows if there will be much of a significant economic downturn from Brexit. Were we due one anyway given the weak NGDP growth over the last 15 months? A fact that Wren-Lewis and other macro-economists have been awfully silent over. Who is to say what “free movement” means once it is up for negotiation? Does it mean exactly what we have now, with full access to UK welfare benefits for all and any EU citizens who move to the UK? Once we have agreed the trade deal with the EU will the EU prevent us negotiating deals with third party countries and blocs that the EU has so signally failed to do itself? Would this be bad for the UK? The answers to these questions and many more will inevitably colour the macro-economic outcome, but these are political questions and macro-economists (and the Bank of England) would do well to make clear their political judgements on these issues before sounding off with such certainty about the economic outcomes. Our fellow Market Monetarists seem to be struggling a bit with making sense of the enormity of the post-Brexit market moves. It’s actually a curse sometimes being a Market Monetarist and having to take wild market moves seriously, or having to interpret them. NGDP Futures markets make sense, little else does. Sure, the swing from 90/10 probability for Remain at 10pm on the 23rd to 0/100 certainty of Leave two hours later was pretty extreme. The huge swings in markets on the news could be seen as the “pure” reaction to the news, but then again what were markets actually pricing from one moment to the next. All sorts of stuff. And once you start trying to analyse market moves in the following days you start to open the Pandora’s box of analysing thousands of things. And you actually then have to start looking at movements prior to the Brexit news, or anticipation of that news, and all the other thousands of things that influence market movements. The Brexit issue has been hanging around the UK, Europe and the world for many, many years. The future of the EU and the Euro Area, likewise. It is tangled up with geo-politics: the Russia question, the breakdown of the Middle East, relations with Turkey. Is the EU a superpower? Is it the EU vs the US. Is it the G7 vs the RoW? Brexit throws all these things up in the air, and thousands more. Ask any International Relations undergrad. Of course the rest of Europe needs to take this very seriously, very seriously indeed. Does he suppose it isn’t? There are lots of issues to consider, thousands, in fact. Sure the EU and the ECB are dysfunctional, but tell us something new. Is it more or less dysfunctional than the US at the moment? Maybe, maybe not. Sumner appears to have slightly lost the plot when he talks of monetary stimulus. There are some facts out there already. The ECB is undertaking huge monetary stimulus already if he means QE or negative rates. Currently, the Euro Area is seeing 40%+ YoY Base Money growth. The ECB is committed to its current and recently expanded programme for at least 18 months. Target interest rates are solidly below zero. What Sumner may mean is changing the targets, rather than ever bigger tools. If he does mean that, then he should say it. We have been arguing here for months that the ECB should either raise its inflation ceiling or far better, switch to NGDP level targeting. 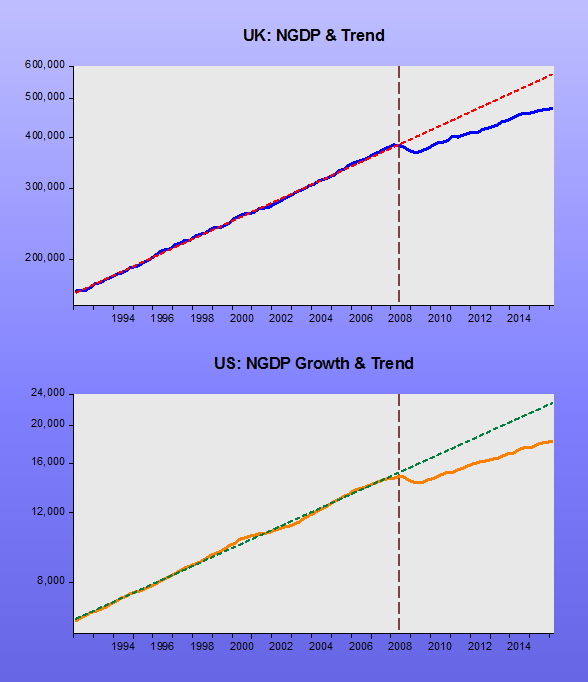 Strangely, things aren’t too bad on the NGDP growth as we have documented. As the chart indicates, as the US began tightening monetary policy in mid-2014 through the “rate hike talk”, we see US NGDP growth trending down. The opposite is observed in the EZ countries. The stimulus is working slowly, but could work so much better if the targets were changed. 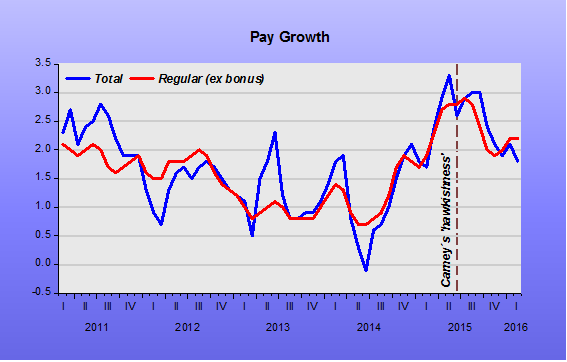 Where were 99% of UK economists in August 2015? It is reported that 90% of UK economists are in favour of the UK remaining in the EU. They have carefully considered the costs and benefits of the UK leaving and mostly decided the economic loss is great, up to 8% of RGDP by 2030 – or around 0.5% per year for the next 14 years. Yet right here, right now the UK is currently losing 1% of RGDP per year from tight monetary policy pressuring NGDP growth to below 3%. But there are no round-robin letters from these economists, no blog campaigns, no nothing. In August 2015 we warned that UK NGDP had fallen to below 3% in 2Q15 driven by a rapidly shrinking growth in the GDP Deflator, indicative of near deflationary conditions. Back then the Governor of the Bank of England was clearly warning that tight money was ahead. It had the effect of reducing NGDP growth further. There was virtual silence from these 90% of economists, except for one or two notable, mostly overseas macro-economists, like Danny Blanchflower. 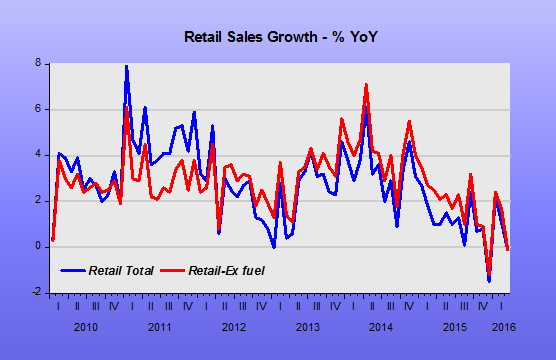 The weak trend in RGDP fuels concern about the management of the economy and adds fuel to the Brexit flames. Similar trends occur in other countries: weak NGDP, weak RGDP, protest movements. 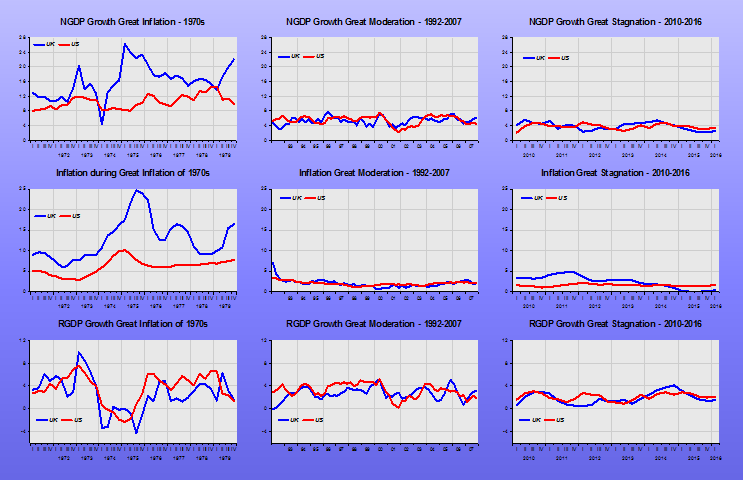 Market Monetarists are clear, below trend growth in NGDP will drag down RGDP. 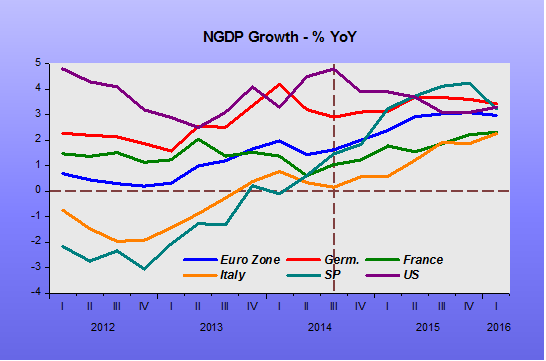 We would like to measure expectations for NGDP growth but that is tough. Longer term government bond yields are not a bad proxy and they are low and going lower in the UK despite Brexit fears about potential credit downgrades caused by Brexit. Of course, global slowdown fears could be trumping UK credit rating fears, but this would still put those latter fears into perspective, i.e. no big deal for the UK’s credit rating or at least for the consequences of downgrades. 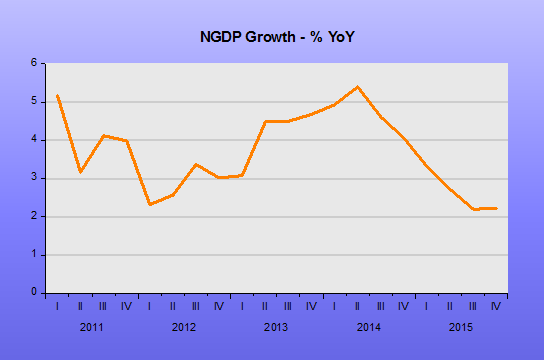 Since the 2Q15 slowdown in NGDP the situation has mostly worsened and dragged down RGDP. 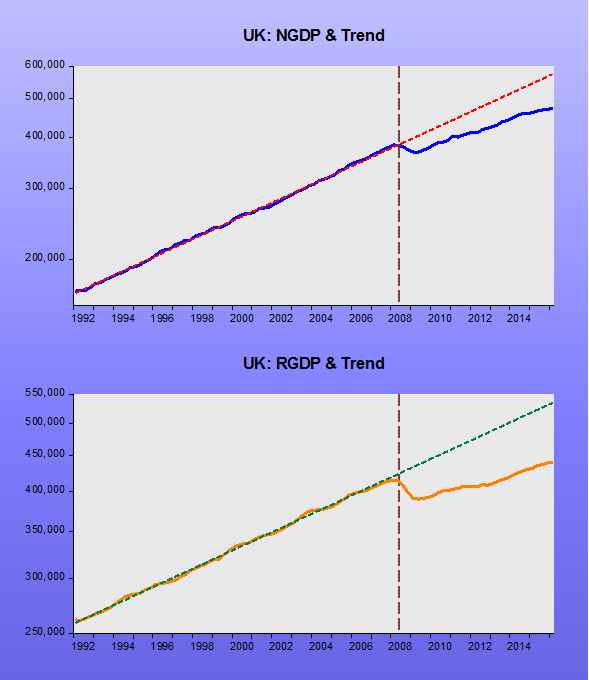 Trend growth in NGDP was 5.3% in the UK 1992-2007 and trend growth in RGDP nearly 3%. Since 2010 NGDP and RGDP growth have averaged 3.8% and 1.8% respectively. 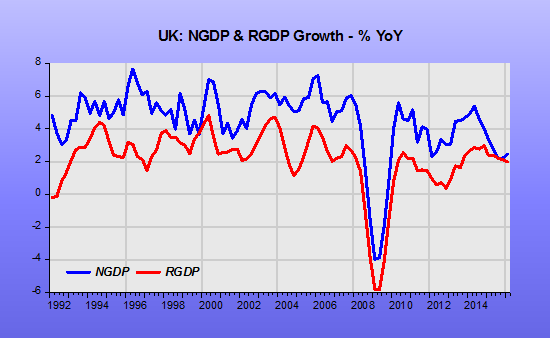 Every time RGDP has moved it appears to have been dragged up or down by NGDP. With NGDP growth averaging 2.4% over the last four quarters we would expect RGDP to be dragged down from its below 2% current level to closer to 1%. The charts below give a more striking view of the depression caused by misguided monetary policy. The same outcome can be seen in the US and Eurozone, indicating that even monetary policy mistakes have become “sinchronized and globalized”! Because of the neglect of NGDP growth by the Bank of England under the targets set by the UK Government, RGDP growth is running perhaps 1% or more below trend. This figure compares with the 0.5% below trend that could result if the worst fears of 90% of UK economists are realised. Yet there is a deafening silence on this current disaster and a very loud campaign about Brexit. These UK economists and their claque in the press and social media should be ashamed of themselves.